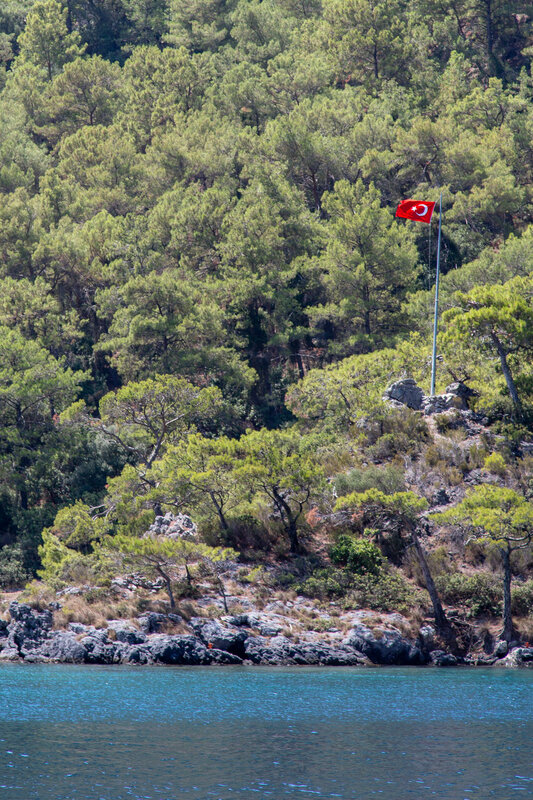 We sailed to Hamam Bay which has become a popular spot for international travellers thanks to one rather famous lady. Partly submerged under water you will find the ruins of the ancient baths where the Egyptian Queen Cleopatra once bathed. Built as a wedding gift from her husband Mark Anthony, the thermal springs underwater come from a volcanic crater in the north of the bay. 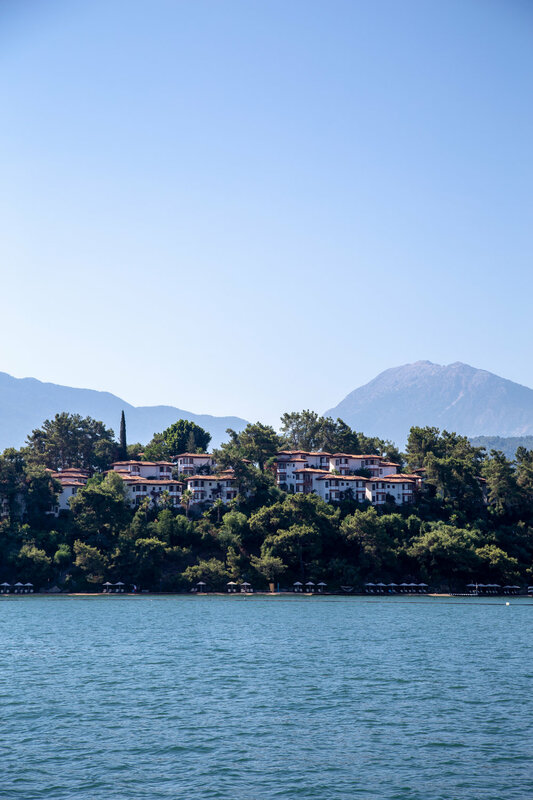 Legend states that Cleopatra owes her beauty to bathing in these waters. 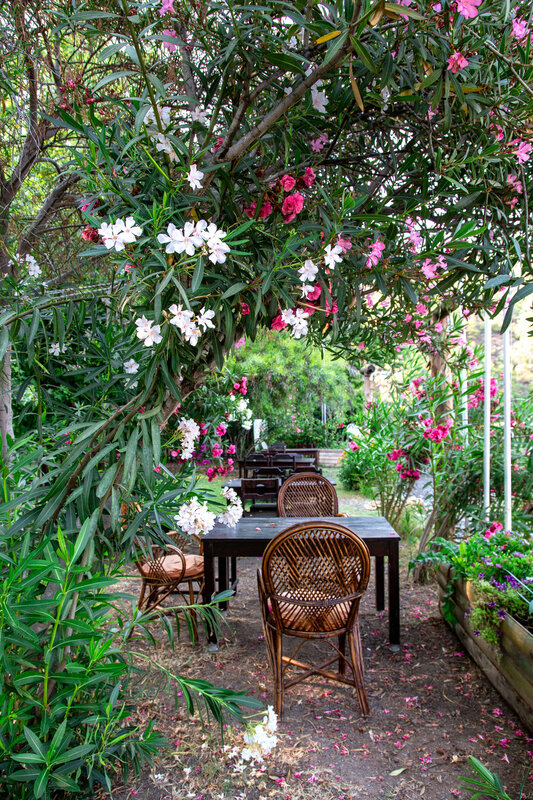 The wonderful thing about this treasured spot is its exclusivity. It's only accessible by water so private yachts make the most of the tranquil setting by mooring close by. 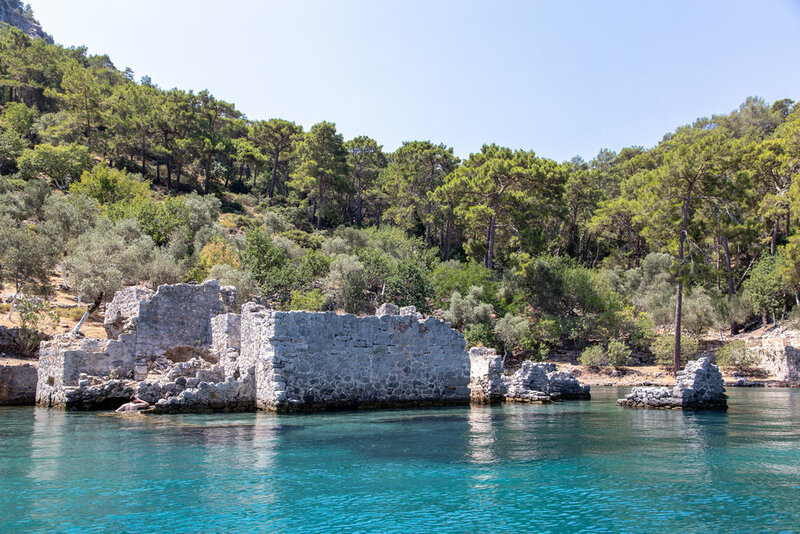 People then get the chance to jump in and snorkel over the ruins and enjoy the crystal clear warm waters set against an incredible backdrop of pine trees. About 30 minutes walk from the bay is the ruined Lycian city of Lydae, now hidden underneath thick plants. We spent the afternoon swimming in the beautiful waters and basking in the sunshine. 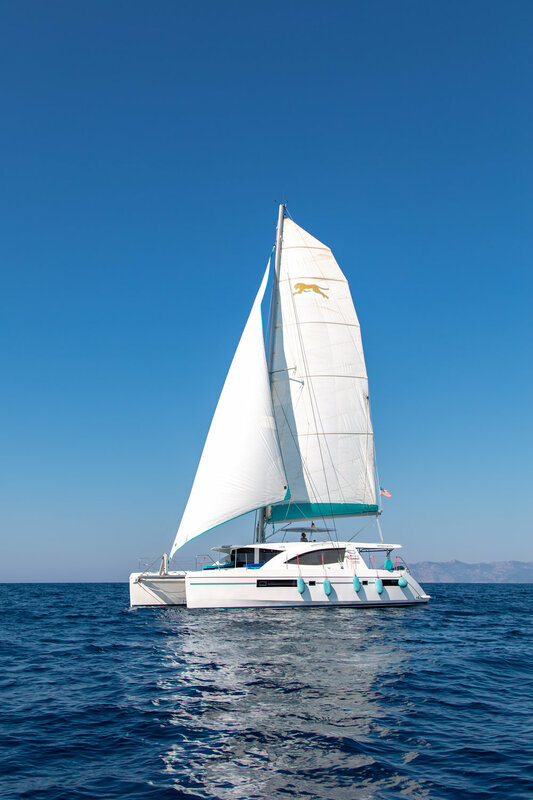 The catamaran has snorkelling gear on board along with beach towels and sunbeds for guests to enjoy - which can only mean more space in the suitcase for kaftans! 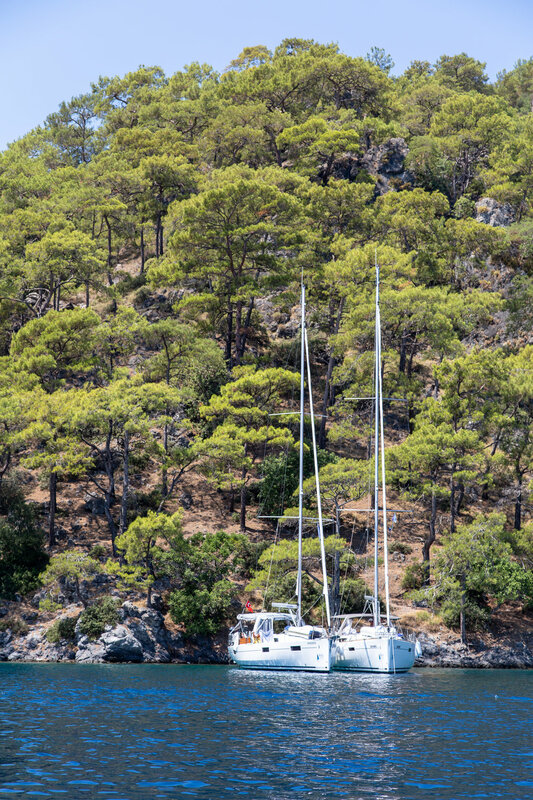 There's good reason why Turkey is one of the world's most popular coastlines to sail. With miles upon miles of unspoilt, rugged mountains, you never tire of the view. The word "turquoise" comes from the French word for Turkish. OK, originally derived from the stone found throughout the country but you will be constantly reminded of turquoise colours when sailing these waters. I really wasn't prepared for how staggeringly beautiful it would be. The "sea and sail" approach to life is incredibly laid back and your everyday woes become a distant memory. If only I could bottle it up and bring back to London! What happens if you're out on the open waters and need a pint of milk? A bottle of chilled rosé or maybe a cashpoint? Fear not, the locals have you covered with their mobile supermarkets in all shapes and sizes. The smaller boats motor around the bays, a quick wave let's them know you'd like to sample their wares. 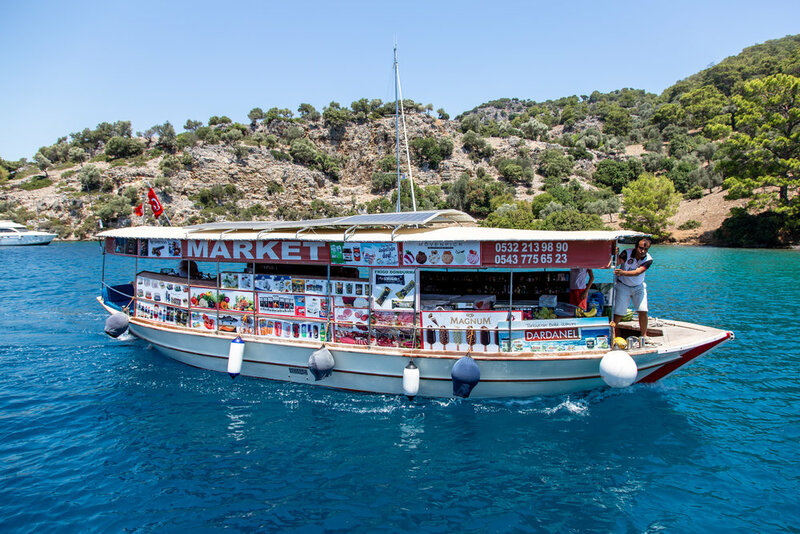 The larger yacht, operated by Migros, is a fully fledged supermarket stocking over 500 items including fresh produce, meat, bakery and deli goods as well as non-food items and an ATM service. Prices are the same as on shore and sailors can track the location of the floating superstore through its own app. As the day went on and the sun began to make its gradual descent, we sailed to the bay of Boynuz Bükü for an overnight stay. Once we'd seen the last of the sun, we freshened up and went for dinner at the local restaurant on shore. We had pre-ordered, thanks to our skipper calling ahead, the slow-cooked lamb to share which is well worth the effort. 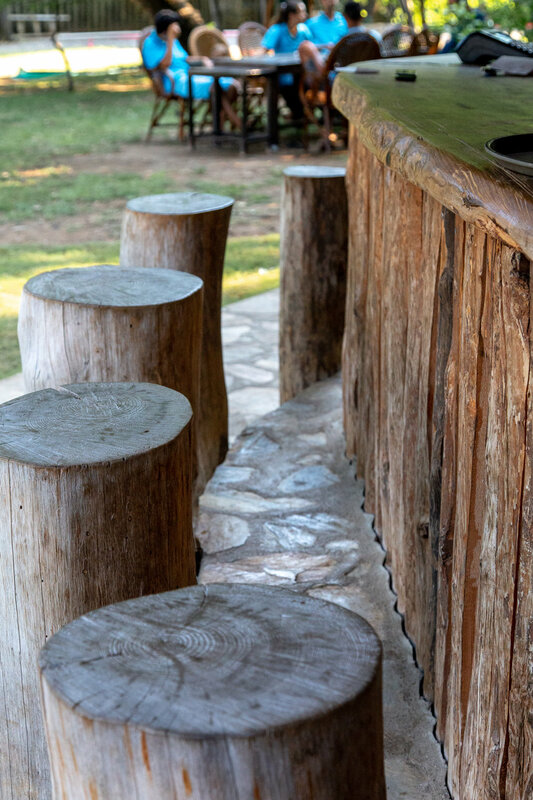 Make sure you bring plenty of bug spray (the restaurant also has bottles to spare!) as the surrounding marsh land attracts the mozzies. 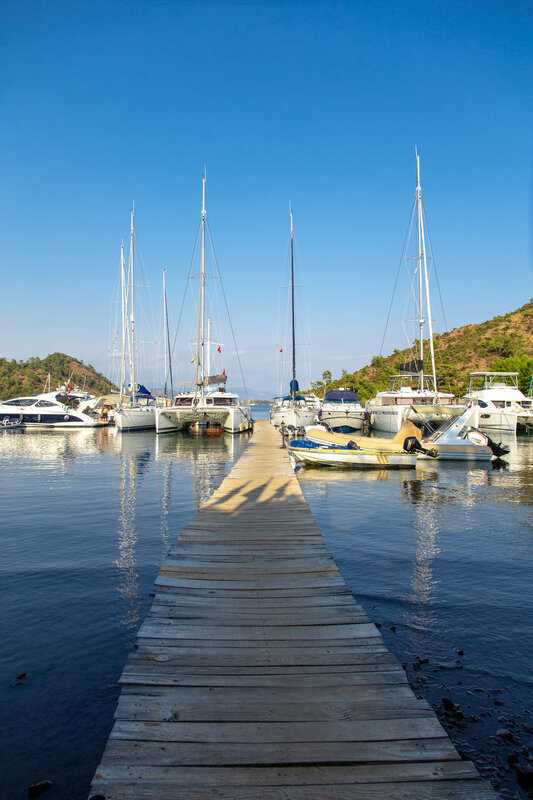 We motored off around 7.30am to make our two hour journey back to Fethiye, the water was calm, the sun was already warm and the views were spectacular. Despite our adventure being limited to a long weekend, we were able to get all the right notes of what a week's sailing could offer. So many bays still to explore and memories to be remembered for a lifetime. 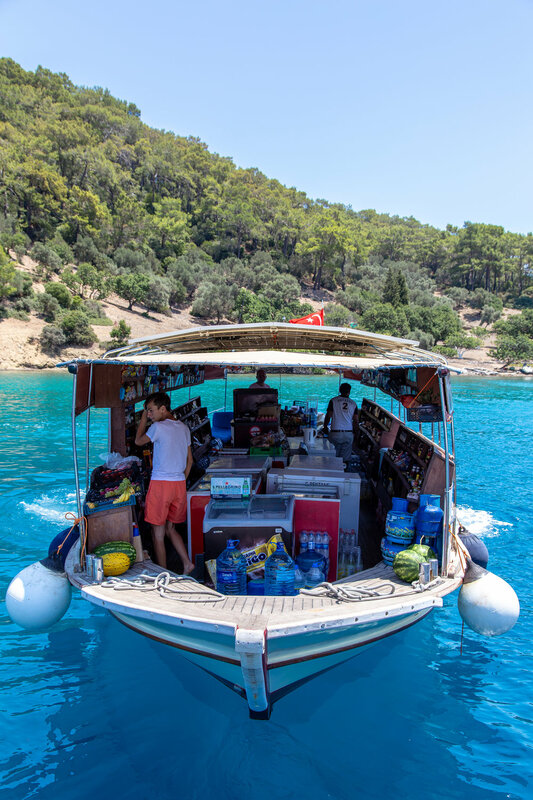 If you're ever considering a holiday that offers a unique adventure for all ages combined with total relaxation and extraordinary views and traditional Turkish food, you must book with www.aegeanyachtcruise.com.